Our privately owned static caravan is set in landscaped grounds at St Helens Coastal Resort. The van boasts comfortable accommodation sleeping 4 people in 2 bedrooms with bed linen included. The main bedroom has a king size bed with a memory foam mattress and ensuite shower room. This is separated by the open plan kitchen, diner and lounge leading to the twin bedroom with 3ft beds which also have memory foam mattresses and an ensuite shower room. The van is double glazed and centrally heated, so warm and cosy in Winter. The kitchen has the convenience of a under counter fridge/freezer, cooker and microwave etc. The lounge has a gas fire and Freeview TV/DVD. Outside there is a decking area with table and chairs and BBQ. (See photos). Cars can be parked by the van. The park facilities include an outdoor heated pool, open May to September and a launderette. The park has a licensed restaurant and there is a short walk to the secluded beach at Priory Bay. St Helens village boasts a family friendly pub 2 minutes walk away serving food all day and a local shop/post office with its own small cafe, where you can enjoy your bacon butties! The Duver beach and cafe is a 15 minute walk away or a 2 minute drive (pay & display parking is available) and is ideal for children and dogs. National Trust land is behind the beach. This includes hand towels and tea towels, but there would be a small charge for bath towels. Please bring your own beach towels. We stayed in B9 for 5 days in August. The caravan was VERY well equipped and well kept. Beds were comfy,water pressure excellent and the kitchen had everything we needed. Great to have a DVD player for the children. Well stocked local shop with freshly baked bread in the morning just a 5 minute walk away. Great pub (The Vine) which was very friendly and served good grub.We are veggies and there was an excellent choice . All in all a great break and we would very happily stay again. Thank you Bryan for a great stay. Wonderful walks and great places to eat. We had a wonderful stay in Birch 7. It was clean and superbly equipped and very spacious for a family of 4. Outdoor seating and BBQ were a real bonus too. The holiday park was perfect for us as it was nice and quiet but our boys of 8 and 5 loved the playground and swimming pool and always found other children of similar ages to play with when they used the pool. It was also fantastically located for exploring the island with beaches close by. We also had a wonderful meal in 'Dan's Kitchen' which is just a few minutes walk from the park on the village green and we would highly recommend. Thank you to Bryan and Debbie for a great holiday and for organising discounted ferry travel. We will most definitely look to return for another stay. A well equipped and comfortable property. Plenty of grounds if you take pets or have kids. The pool is old school and concrete so requires care with the kids, but it is heated so they liked it. The park itself seems to be more live-in occupancy than holiday properties. Our property was really clean with friendly helpful owners and a good base location for exploring. The local pub is very disappointing considering it's prime spot opposite the green. The beach cafe/restaurant has good food but it's a very long wait for it! Overall a good spot for a short break and we enjoyed it. We thoroughly enjoyed our ten days stay in B7, which was very well equipped, comfortable and clean with lots of nice little touches from Brian and Debbie that made it a home away from home. They clearly take pride in ensuring their guests are comfortable. We left it rather late to book and consequently found ourselves considering a static caravan which we wouldn't have usually considered. My wife was 30 odd weeks pregnant too so comfort was very import. Anyway we weren't disappointed and would definitely book again. 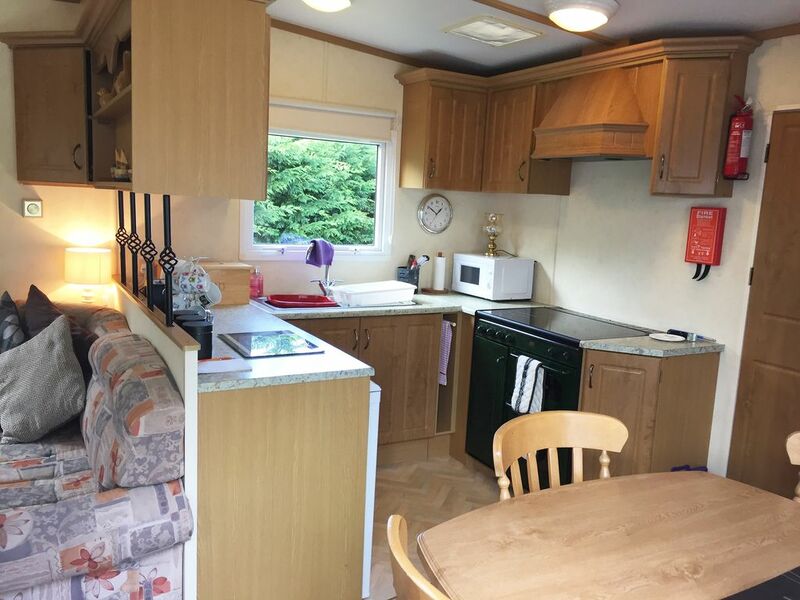 The location is also fantastic both in terms of the caravan on the site (a nice spacious corner plot) but also where the site is located on the island. St Helens is very peaceful and the beach is great. Lots of families with children so our daughter made plenty of friends and we got some relaxation.